Both the Northern and Southern hemispheres have jet streams, although the jet streams in the north are more forceful due greater temperature gradients. 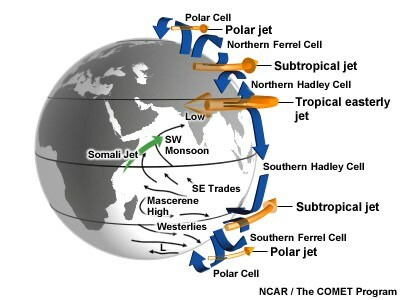 There are two permanent jet streams – subtropical jets at lower latitudes and polar front jets at mid-latitudes. 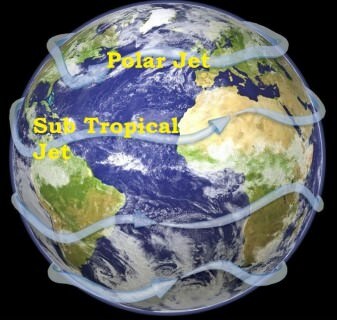 The sub-tropical jet stream is produced by the earth’s rotation (Coriolis force) and temperature contrast between tropical and sub – tropical regions. At the equator, the rotation produces greatest velocity in the atmosphere. As a result, the rising air which spreads out northwards and southwards, moves faster than the latitudes over which it is blowing. It is deflected to the right in the northern hemisphere and to the left in the southern hemisphere, and at about 30° latitude, it becomes concentrated as the subtropical jet streams. During winter, the STJ is nearly continuous in both hemispheres. The STJ exists all year in the southern hemisphere. However, it is intermittent in the northern hemisphere during summer when it migrates north. The STJ can be temporarily displaced when strong mid-latitude troughs extend into subtropical latitudes. When these displacements occur, the subtropical jet can merge with the polar front jet (Related to Cloudbursts. We will study this in Indian Monsoons). The polar front jet is produced by a temperature difference and is closely related to the polar front (more about fronts later). It has a more variable position than the sub-tropical jet. In summer, its position shifts towards the poles and in winter towards the equator. The jet is strong and continuous in winter. It greatly influences climates of regions lying close to 60 degree latitude. It determines the path and speed and intensity of temperate cyclones. While the polar and subtropical jet streams are the best known and most studied, other jet streams can form when wind speeds are above 94 kph in the upper atmosphere at about 9 – 14.5 km above the surface. They are few. Important ones are Somali Jet and The African Easterly jet. There are also major high velocity winds in the lower troposphere called low-level jets (LLJs). In the tropics, the most prominent of these are the Somali Jet and the African Easterly Jet. The TEJ is a unique and dominant feature of the northern hemispheric summer over southern Asia and northern Africa. The TEJ is found near between 5° and 20°N. It is fairly persistent in its position, direction, and intensity from June through the beginning of October. During the south Asian summer monsoon, the TEJ induces secondary circulations that enhance convection over South India and nearby ocean. The establishment and maintenance of the TEJ is not fully understood but it is believed that the jet may be caused by the uniquely high temperatures and heights over the Tibetan Plateau during summer. The TEJ is the upper-level venting system for the strong southwest monsoon. The Somali jet occurs during the summer over northern Madagascar and off the coast of Somalia. The jet is most intense from June to August. It is a major cross-equatorial flow from the southern Indian Ocean to the central Arabian Sea. A split in the axis of the jet over the Arabian Sea, the more northern branch intersecting the west coast of India near 17°N, while the southerly branch moves eastward just south of India. The jet remains relatively steady from June to September before moving southward to the southern Indian Ocean during the winter. Jet streams help in maintenance of latitudinal heat balance by mass exchange of air. PFJ influence the mid-latitude weather disturbances. Usually there are severe storms when jet streams interfere with surface wind systems. Jet streams also influence the path of temperate cyclones. They have an influence on distribution of precipitation by the temperate cyclones. Jet streams also exercise an influence on movement of air masses which may cause prolonged drought or flood conditions. How does jet streams affect the weather in temperate regions? 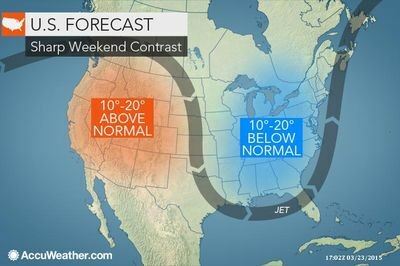 PFJ play a key role in determining the weather because they usually separate colder air and warmer air. Jet streams generally push air masses around, moving weather systems to new areas and even causing them to stall if they have moved too far away. PFJ play a major role in determining the path and intensity of frontal precipitation and frontal cyclones or temperate cyclones. Polar jet has distinct peaks (ridges) and troughs. Ridges occur where the warm air (at high pressure) pushes against the cold air. Troughs occur where cold air (at lower pressure) drops into warm air. This condition occurs due to weak jet stream which is weak due to lesser temperature contrast between sub-tropics and temperate region. These ridges and troughs give rise to jet streaks which are the main reason behind cyclonic and anticyclonic weather conditions at the surface. The winds leaving the jet streak are rapidly diverging, creating a lower pressure at the upper level (Tropopause) in the atmosphere. The air below rapidly replaces the upper outflowing winds. This in turn creates the low pressure at the surface. This surface low pressure creates conditions where the surrounding surface winds rush inwards. 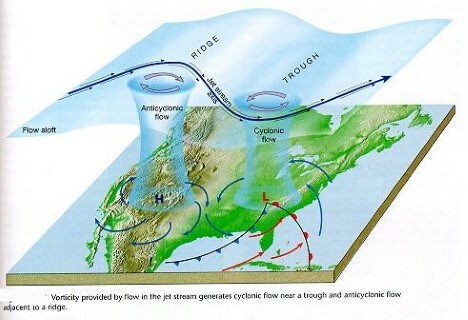 The Coriolis effect creates the cyclonic rotation that is associated with depressions. The winds entering the jet streak are rapidly converging, creating a high pressure at the upper level (Tropopause) in the atmosphere. This convergence at upper troposphere leads to divergence (high pressure) at the surface (anticyclonic condition). 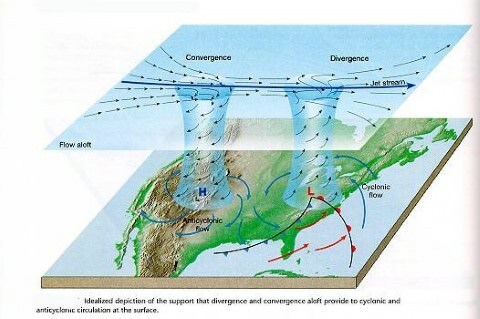 The Coriolis effect creates the anticyclonic rotation that is associated with clear weather. Jet streams are used by aviators if they have to fly in the direction of the flow of the jet streams, and avoid them when flying in opposite direction. Jet streams can also cause a bumpy flight, because the jet stream is sometimes unpredictable and can cause sudden movement, even when the weather looks calm and clear. During volcanic eruptions plumes of volcanic ash have a tendency to get sucked into the same jet stream that airplanes use for travel. Other planets have jet streams as well, notably Jupiter and Saturn.